Take control of your LS engine with Terminator X Max! 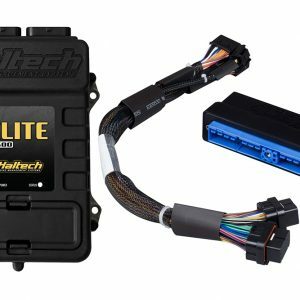 Don’t settle for a junkyard ECU with a cumbersome tuning interface when you can have complete control of your engine, self-learning fuel strategies and the proven, race-winning technology of Holley EFI at a budget-friendly price! Terminator X Max features real-time fuel learn, high impedance injector drivers, an integrated 1bar MAP sensor, and 4 programmable inputs and outputs. The inputs and outputs are ideal for electric fans, boost control solenoids, progressive nitrous control, and much more. Part number 550-916 also has 4L60 or 4L80 Transmission control. Terminator X Max comes fully loaded with base maps for common LS engine combinations to get you out of the garage and on the road/track fast. The 3.5″ touch screen LCD handheld contains an easy to use calibration wizard as well as tuning and gauge display functions. Also included is Holley EFI’s industry-leading, easy to use software suite that allows full laptop access for advanced users. Whether you are building a budget beater or a boosted race car, Terminator X MAX has the features and technology you need at a price that won’t break the bank! Real-Time fuel map learn, takes the guess work out of tuning your base fuel table. 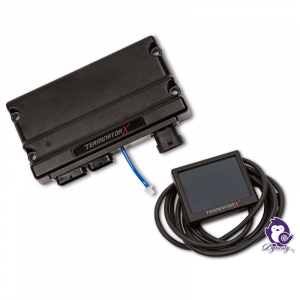 All of the new Terminator X Max systems utilize the Bosch LSU 4.9 wideband to relay AFR information to the ECU for accurate reading and precise tuning control. On-Board 1bar MAP sensor, is perfect for N/A or Nitrous engine combos. If your combination requires a 2+Bar, we recommend GM 12592525, and our adapter part number 558-416. Advanced Tables – 4x 1D Tables, 1x 1D per Gear Table, 4x 2D Tables, 1x 2D per Gear Table, can be used for any custom tables you can dream up, such as Flex Fuel Sensor Offset Table, or a custom fuel or oil pressure safety! The included 3.5″ Touchscreen Handheld contains a calibration wizard, that allows you to quickly build a base tune for any LS engine. Additionally the handheld provides internal data-logging and a fully customizable gauge display. 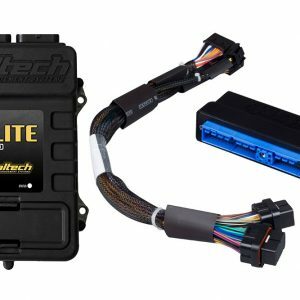 The compact ECU size allows you to mount it virtually anywhere. Remember, diagnostic LEDS must face up! 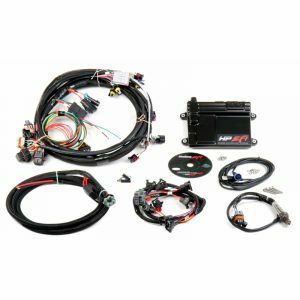 Plug and play compatible with more Holley EFI accessories such as; analog style gauges, shift lights, various modules, and coming soon, 12.3″ digital dash support!